Hello folks, and welcome to my “about page”, which will hopefully explain why I play the music I play and what inspires / drives me musically—without being too embarrassing! I’ve often been asked “how did you get into Celtic music?”, which is a reasonable question but a bit hard to answer; I now realize that I didn’t really get into Celtic music, it got into me. I grew up in Dundee, Scotland in the late 50s to 70s surrounded by Scottish and Irish people, songs, culture—that’s just the way things were—and I never really thought anything of it; I thought everybody was just like us. Apparently I was a fairly naïve wee boy. In those early days for me, traditional Scottish songs were performed by opera trained artists. Try as we might, it was hard for “ordinary folk like us” to identify with them, though we did listen to them a lot as variety was not a strong point of Scottish TV & radio (understatement!). New, different acts like Andy Stewart, the Corries, and Hamish Imlach (in Scotland) and the Clancy Brothers, Dubliners, Christie Moore and many others (in Ireland) emerged and took the old traditional songs and gave them a lift and twist (polite language for a kick up the bahoukie!) that created a new surge of excitement and interest in our Celtic musical heritage. The one thing that struck me about all of these songs was the delivery and passion of the performers. These weren’t just songs; they were stories and shared experiences, glimpses of times gone by all put in context so you could be a part of that time, that experience, that feeling—your spirit would be lifted or your heart would break depending on the song, no matter how many centuries old it was. It all started with a party… and not just any party: Scottish Hogmanay (New Year’s Eve) parties were a real highpoint for us. Most workers had a day off on 31st December (they didn’t get that at Christmas) and families would visit each other after midnight. That was called first-footing; it was lucky if the first foot over your door threshold belonged to a tall dark and handsome person, and they also needed to bring you a present: a lump of coal was a lucky present… a drink of whisky was also very acceptable! For our part, we would end up in the Gibson’s house two houses down from us; they held the best parties by far! Mr and Mrs Gibson welcomed people from all over and insisted they did a “party-piece” where each person in the room would perform: a song, a joke, a story, a dance… there was no escape; everybody had to do something. The Gibson children, Danny and Hazel, were older than my brother Doug and I, and were very musical. Together with Hazel’s 1st boyfriend, John—a “beatnik” going to Dundee Art College (super cool, opinionated, beard, long hair, pipe smoking, corduroy trousers, tweed jacket with elbow patches)—Danny and Hazel would sing, play guitar, harmonize—they were brilliant—weaving spells around us all. I would have done anything to just join in and be a part of it. At the age of 11, I made a new year’s resolution, desperate to surprise everyone at the next Hogmanay party: I would learn the guitar and be able to really join in. I spent many hours the following year in secret up in the bedroom I shared with my older brother Doug, holed up with his guitar and song books (my folks could only afford lessons for one of us… and it wisnae me!) My goal was to prepare myself for the party so I could surprise everyone by playing the guitar and singing songs. The next Hogmanay, when it was my turn to perform, I (casually) asked to borrow Danny’s guitar and—much to everyone’s surprise (including my mum & dad’s)—I played two songs and sang. Way-hay!!! All of a sudden I was in, an accepted part of the musical inner circle. From that time, at every opportunity there was, I would be there, soaking up songs and playing and singing along. By the time I was 16, I could, and did, entertain at all sorts of parties on my own, no problem—I had developed a fine Celtic song repertoire by then. Meanwhile, the music scene in Dundee was moving fast in many directions: Bob Dylan, Buddy Holly, Leonard Cohen, Elvis, The Beatles, Creedence, the Rolling Stones. I was playing guitar and learning songs of every kind; I just loved how I could skip from one world to the next as a song, tempo, genre or mood would change. I kept my Celtic music going for my own consumption and for something different at my friends’ parties (who mainly played rock and pop music, but still liked a good sing-song thrown in). I also answered the call of rock and roll and formed a 5-piece band, “Badge”. We played rock and pop and were booked at dances, weddings, events, and discos, mostly in Dundee or Perth, but we would travel all over Scotland in the weekend for gigs when needed; the money was poor, the nights were long, but boy—we were on top of the world! We would slog through the week at college or work, but when the weekend came—Yahoo!—we were gigging again and loving it! When I was 31, I moved from Dundee to Aberdeen for work and left the band. After 15 years of solid playing, this was hard to do, but I felt it was time to see what else life had to offer. My wife Dorothy and I lived in Aberdeen for a few years before we went to live in the Netherlands, where we had our family. I didn’t play for several years: not until I started playing with a musically gifted Irish colleague of mine, Feargal Maconuladh. I have never heard Feargal sing a duff note; he has an incredible voice. We started playing for fun at work and quickly realized we not only had the same taste in Celtic music—we were also pretty good! We started playing gigs in the Netherlands as the Duo “Keltic Fire”, and we had a great time establishing ourselves musically. We were a bit of a novelty as our audiences loved the idea of Celtic music, but had very little experience of it for the most part. Again, the emotional connections these old songs would make with our audience were wonderful to see: with no real folk singing tradition comparable with our Scottish and Irish ones, the Dutch audiences loved this new vibrant cultural exposure. Feargal and I played together for 6 years (including recording two albums), and after that, I moved (with the family) to the USA for work, and Feargal moved to Barcelona. 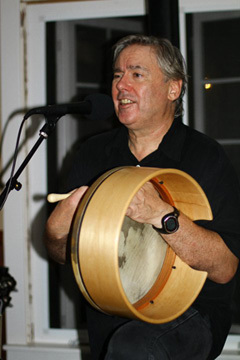 Late in 2008, David Maher heard me play with Feargal during one of Feargal’s visits from Barcelona, and he asked me to play in his new Irish pub, Maher’s, in Lake Oswego, Oregon. 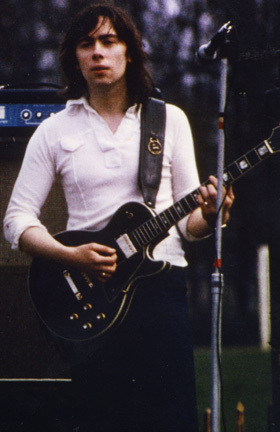 At first I was reluctant to play solo and I didn’t really want to play with anyone else—Feargal was a hard act to follow—but I gave it a try one evening and played around 8 songs just to see how it would go. The crowd loved it and so did I. 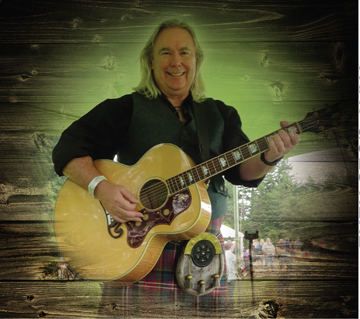 Since then I have built up a large collection of Scottish, Irish, English, American, and other songs which allows me to tailor what I play to the audience I have in front of me. I was always aware when playing in pubs that the customers didn’t necessarily come to see me; they came to be entertained, which I could do pretty well. When I play in pubs now, I (mostly) have the best of both worlds in that the crowd wants to be entertained… AND the majority of them are there to see me.. In September 2013, at the age of 57, I took a big step and left a good job to follow my passion for music. I now have time, focus and the energy to take my musical career to wherever it is going. You only get one life: you’d better live it to the fullest. I love playing and seeing the impact I have on people in my audience. In the USA, I watch people as they are transported to places I create by singing them songs from their forefathers, places and experiences they have heard of from their parents or grandparents. They still have an emotional bond to the “old country” where they have never lived, and a piece of their spirit still wants to connect them there. It’s wonderful to see. Since September 9th 2014, I have been travelling the USA & Canada with my wife Dorothy, exploring this great continent, visiting friends and family dotted around - and of course, playing music wherever I go. We arrived back in June 2016 to the Pacific Northwest after my 2nd year of touring. It's been wonderful. We've made friends wherever I've played a lot of music, seen so many beautiful places (and some horrible ones), sold a lot of "The Beginning" CDs and I have now written and recorded my 2nd solo album. This is my first ever original album full of stories and memories - all things that have been on my mind - I've been "Mullen It Over".